In this episode we finally catch a glimpse of Arkham in its early days, the episode had many references to the future of its universe; some of them were even as simple as the way the episode was shot. 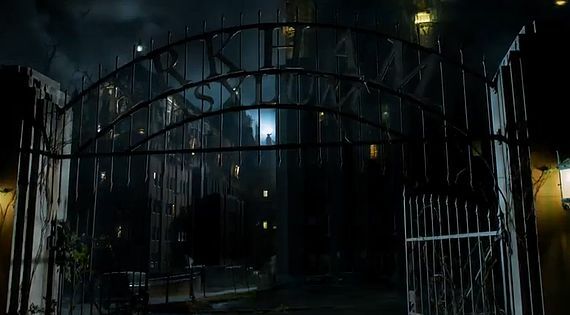 I am pleased that Arkham Asylum has finally appeared in Gotham, it is one of the few really iconic elements of the Batman universe that could be in the series without ruining the premise, that it is a prequel. 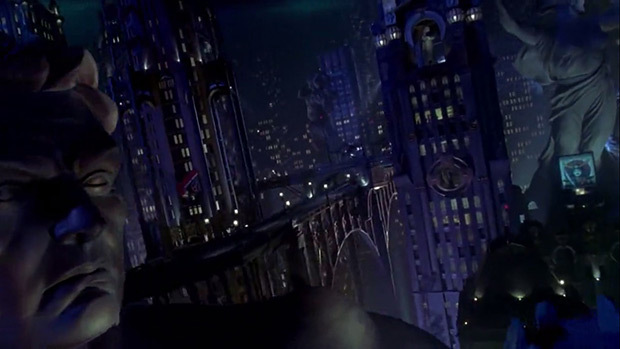 From the second scene the references to the Batman franchise began with multiple visual inflections of the source material. Throughout the entire, tense scene between Oswald and James a spotlight was rolling through the street, giving us a visual reminder of the Bat Signal. Something much more significant also occurred during this scene which was the appearance of a gang of skipping girls that appeared to be much like Batman villain, Harley Quinn. 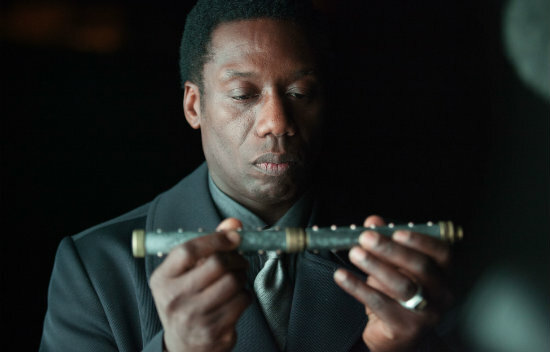 Could it be that perhaps Quinn will appear in an episode with a gang of carnival maniacs? Gotham was superbly shot this week, Gotham, particularly Arkham as we saw in this episode provides a versatile environment for drama. 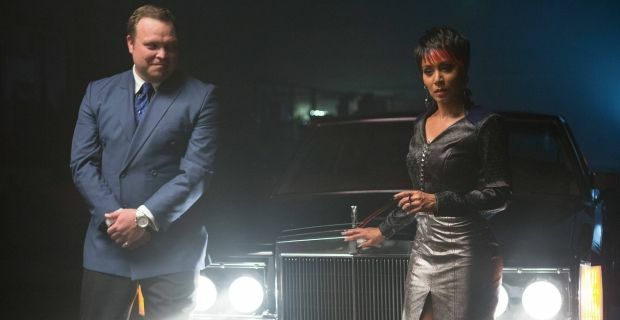 The set designers have created a timeless town with beautiful and fascinating architecture, the style of Gotham’s older settings are a throwback to Joel Schumacher’s version of the city. If anything the design of Gotham is the only thing about Batman and Robin that can be salvaged. Arkham Asylum was a fascinating environment; it seemed to be a completely different location in the daytime to at night. During the day it seemed to be just like any other institution; a collection of beige buildings with the odd gargoyle feature here and there, nothing out of the ordinary. Whereas at night, the asylum, particularly the gate, took on a much more gothic appearance. 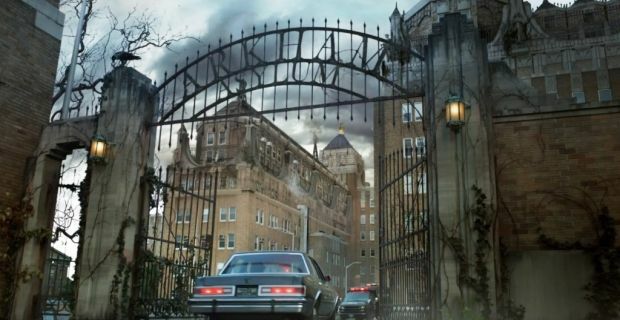 The threatening and dark look of the asylum is one of the most influential elements of the source material, there is something about the Arkham Asylum gates that always fill you with dread, as well as certainty that something very dark and very frightening may be about to happen. I sincerely hope there will be much more focussing on Arkham Asylum in the episodes to come. It seems that there certainly will be more on the Arkham district in the future as this episode set the ball rolling on a plot line that involved a war between Falcone and Maroni over the Arkham district. It would be interesting if in the pursuit of this storyline the producers also fleshed out Arkham more as a town, we have never had a proper glimpse of the district as a whole, only the lunatic’s asylum. Increasing the number of visuals we get on locations in the Fox DC universe serves to deepen it and make it feel much more alive. To conclude, this was another strong episode, it helped that the beginning of the episode was a very tense and brilliantly acted scene. Any time you put Taylor’s The Penguin and Mackenzie’s James Gordon on the screen together there is sure to be fireworks.